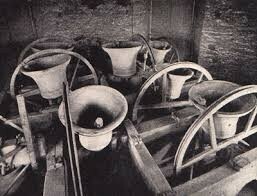 "We record with sorrow the death of Tom Rawlings, a lifetime resident of Cropwell Bishop, a keen bell-ringer and former Churchwarden. For many years he looked after the Memorial Hall after retiring from the Gypsum Works until ill health made it impossible to continue. We offer sympathy to his relatives and friends"
If you can add any further information about the life and times of Towm Rawlings, please leave details via the 'Comments' link below. Thank you. This page was added by Website Administrator on 12/12/2013.